High Fidelity virtual world now has the ability to record non-player characters (NPCs) in a virtual world. You can now capture your actions in-world and play back your avatar’s actions on a separate model. This ability is very useful for educationalists, teachers and lecturers who can use it to leave a legacy of live lessons and lectures. This function combined with the high concurrent user rate on servers (currently tested with 110 avatars) opens up possibilities for a functional teaching experience on par with face-to-face teaching. Second Life is an online 3D virtual world with spaces for people to meet, chat and interact through animated characters known as Avatars. You can customise avatars so that you are represented to other users in any way you please. Many educational institutions are using Second Life and other virtual worlds for teaching and learning. Virtual spaces can be used to good effect in subjects of a physical nature like anatomy, or where virtual simulations are cheaper, safer or more practical than setting up a real world scenario. Here's a segment from the fabulous QI (Series H) with two stories of online relationships; one in Cornwall and another in Japan. This episode features (the Great) Eddie Izzard bemused upon hearing about avatar relationships in Second Life. You may be interested in this research we did a couple of years ago. 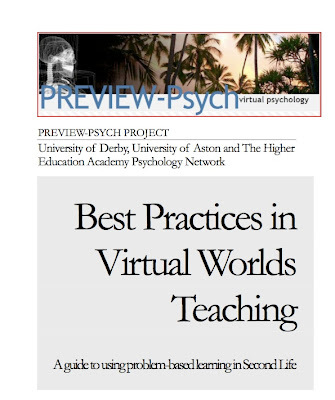 Our (Bignell, Parson, et al) Best Practices in Virtual Worlds Teaching Guide produced by University of Derby and Aston University in collaboration and funding from the Higher Education Academy Psychology Network and JISC is available in soft and hard copy. The guide features tips and advice on setting up teaching in virtual worlds using problem-based learning methods. It’s designed primarily for those teaching Psychology, humanities and the social sciences but will be useful to anyone starting out teaching using virtual worlds. A conference talk at De Montfort University's First Cyberpsychology Conference. September 2013. Here's a link to my presentation at at De Montfort University's First Cyberpsychology Conference. '3D Virtual Avatars and Machinima to Educate Students about Sustainability' There's some embedded video in the presentation as an example of some of the rapid development of machinima we've been doing using the virtual world Second Life. Here's a link to my presentation at Virtual Worlds Best Practices in Education 2013. This is is a global grass-roots community event which focuses on education in immersive virtual environments. This open conference is organized by educators, for educators, to provide an opportunity to showcase the learning that takes place in this community of practice. Using Second Life Avatars and Machinima to Introduce Sustainability into the University Curriculum: Evidence from Two Funded Pro-Environmental Behaviour Studies. In 2011 the Higher Education Academy (HEA) in the UK funded seven projects to look at Education for Sustainable Development (ESD) in the Professional Curriculum. Cyberspace technologies featured strongly in utilising a wide range of professionally-accredited undergraduate degrees to explore the ways in which interdisciplinary awareness of sustainability issues is encouraged or prevented by professional requirements. The first project reported here “Problem-based Learning in Virtual Interactive Educational Worlds for Sustainable Development” (PREVIEW-Sustain) exploited the distinctive properties Second Life by using problem-based teaching methods with digital avatars in (the virtual) world. In a previous JISC-funded project led by the author with Aston University and the ‘HEA Psychology Network’ we previously validated, transferred and disseminated immersive cyber-activities and materials adapted from Coventry University’s Second Life ‘PREVIEW’ project for use in mental health awareness and Psychology teaching. The follow-on PREVIEW-Sustain project reused and transferred these teaching methods to introduce Sustainability education to academic staff and students across two university subject groups (Psychology and Geography) by using customised online problem-based scenarios. This presentation reports the virtual world methods developed and redeployed for the Sustainability agenda. The work existed entirely in the online virtual world populated by highly personalised 3D digital avatars. We conducted a series of learning scenarios with University staff and students highlighting motivational and behavioural factors that impact on real-world environmental sustainability (e.g., resources, recycling and energy efficiency). These materials are available to the wider teaching community. 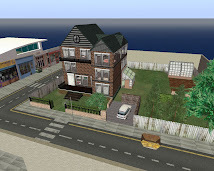 The project’s ‘virtual’ infrastructure is in place within the virtual world Second Life. The online videos of the Second Life avatar interactions we developed, to further engage the community, later provided the basis for a follow-on research project which will also be reported here. We used filmed avatar interactions to assess changes in real world pro-environmental behaviour. We embed these videos in the University’s online teaching ‘virtual Learning Environment’ and assessed students before and after exposure to the environmental messages in the machinima. Innovative cyberspace teaching and learning techniques offer flexible, cost-effective and rapidly deployed Higher Education solutions. Further research using similar virtual world techniques is planned that will explore Disability Awareness. Here's the slides from my Keynote lecture at the Cyberpsychology and Computer Psychology conference 2012 (CyComp2012) held at Bolton University. I've also included my Abstract below. This is a really valuable conference and I very much enjoyed meeting many new contacts and old friends. The Fall and Rise of Virtual Worlds in Online Teaching and Research: Early Adopters, Geek Cliques and Cool Innovation. Speaker: Dr Simon Bignell (Lecturer in Psychology, Centre for Psychological Research, University of Derby, UK). Early Adopters, Geek Cliques and Cool Innovation. Online multi-user virtual environments such as Second Life™ are computer programs populated with personalised digital avatars that offer users the potential to engage in customised lifelike learning activities. Once developed, teaching and research materials created ‘in world’ are persistent and can be accessed continuously, mashed with other online services or used for real-time group activities. The highly immersive nature of multi-user virtual worlds such as Second Life™ and the economies of scale of deployed e-learning and online research make these methods increasingly appealing across the education sector. However, developing and delivering teaching in virtual worlds is challenging, requires planning and possibly requires relinquishing much control to the learner. Likewise, doubts exist about the validity for conducting research and ethical issues remain about anonymity, avatar identity and reliability of the data produced. Within Second Life™ many Universities are using problem-based learning, simulation and role play to provide digital learning environments that are comparable to the contemporary classroom with all of the advantages of a fully immersive online/distance learning platform. Additionally, the platform offers educationalists and researchers licence to go beyond traditional pedagogic and experimental methods. Thousands of virtual world settings have be developed as highly experiential real world simulations but it is also possible to offer a ‘stripped-back’ teaching space that removes distractions from the learner’s environment and focuses on individual sequential learning. The benefits are also clear for researchers wishing to remove confounding variables from their virtual experimental space or to fully immerse their participants in a virtual context (or body) and maintain experimental control. The challenge to these innovative spaces is in realizing their potential without being bogged-down in technology. 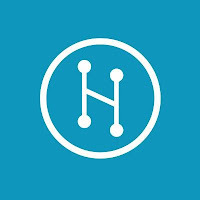 This talk follows several funded projects by the author and collaborators and plots the progress and future direction of teaching and research in these evolving online digital communities. The University of Bolton Computer and Cyberpsychology Research Unit (UBCCRU) based in the Psychology Subject Group of the Faculty of Wellbeing & Social Sciences, are holding a two-day conference on cyberpsychology and computer psychology (CyComP2012). The conference will be held at the University of Bolton on Monday 16th and Tuesday 17th July, 2012. Fee includes morning and afternoon coffee and lunch. Our (Bignell, Parson, et al) Best Practices in Virtual Worlds Teaching Guide produced by University of Derby and Aston University in collaboration and funding from the Higher Education Academy Psychology Network and JISC is available in soft and hard copy. The guide features tips and advice on setting up teaching in virtual worlds using problem-based learning methods. It’s designed primarily for those teaching Psychology, humanities and the social sciences but will be useful to anyone starting out teaching using virtual worlds. In an expansion to my PREVIEW-Psych project, in collaboration with Rosemary Horry (University of Derby) and with generous funding from the Higher Education Academy, I'm using the virtual reality platform Second Life to gauge people’s unconscious attitudes towards ‘green’ issues such as recycling. This video outlines the project. There’s a link here to more information about the project at the University web magazine here. There's also information over at the PREVIEW-Psych sister site here. If you're interested in Green or 'Education of Sustainable Development (ESD)' issues within Second Life or have a Psychological interest in the area drop me a line, I'd be pleased to hear from you. A really nice presentation given to the Department of Information Studies, University of Sheffield by John from Virtual World Watch (VWW). The project produced comprehensive regular reports on ’who’ is doing ’what’ with virtual worlds in UK universities and colleges.